Wally's Desert Turtle's private dining rooms can be transformed to meet your needs for business or social occasions. From birthdays to bar mitzvahs, from breakfast meetings to client dinners, from wedding receptions to anniversaries....the possibilities are endless. Explore the options below and find out how Wally's can help make your next event unforgettable! ​Whether you’re celebrating a one year anniversary as a couple, your tenth anniversary as partners, or your Golden 50th anniversary together, Wally’s Desert Turtle makes your big night an extra special one. 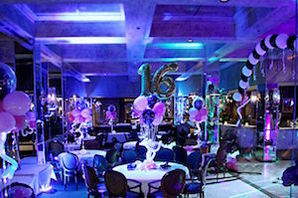 ​We provide full planning services for unforgettable bar/bat mitzvahs that are as unique as your child is. We'll turn our private rooms, or the entire building, into a magical space for this special rite of passage. ​When it comes time to show someone just how much they are appreciated, for all their hard work, nothing says “Thank You” quite like Wally’s Desert Turtle. For over thirty-eight years Wally’s has been the spot to truly show how much you care. ​The significance of a special award, is heightened by having the event at Wally’s Desert Turtle. Centrally located in the heart of the Coachella Valley, Wally’s offers a unique destination for any special event . ​A special toast on the biggest day of the year, a loving dinner in one of our private dining rooms, capped with one of our custom homemade birthday cakes; nothing is as special, as a night out at Wally’s. We can help in all aspects of the planning your Quinceañaria, including the Quinceañaria Brindis and the Baile de Sorpresa. Visita nuestra pagina de internet o llamanos para precios y presupuestos por telefono. ​Why take chances when it comes to the most important event in your life? Wally’s Desert Turtle’s private rooms are the perfect location for rehearsal dinners, bridal showers, grooms dinners, or wedding receptions. ​A mom-to-be deserves to be pampered, so treat her to a baby shower in one of the private rooms here at Wally’s Desert Turtle where she and her guests will enjoy a comfortable, classy celebration. ​Wally’s Private Dining rooms can accommodate almost any corporate function or business event. We offer a variety of menus, and access to state-of-the-art A/V technology to help make your seminar impressive. ​Wally’s Desert Turtle will help in all of the planning for your daughter’s special day. From the décor to the cuisine, and everything in between, every aspect is coordinated to reflect the feel of your affair. Please contact Stephen Jeffers in our Special Events Department for all of your event needs.